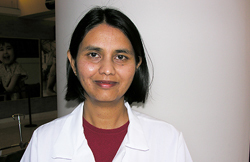 The study, led by Pratima Sharma, M.D., M.S., an assistant professor in the Department of Internal Medicine, examined the effect of MELD score-based allocation on post-liver transplant kidney failure. MELD, which was introduced in 2002, is a scoring system that evaluates liver disease severity and has since become the basis for deciding which patients receive liver transplants. The researchers found that the risk of developing post-transplant kidney failure among liver transplant recipients has increased by 15 percent in the MELD era compared to pre-MELD era. The findings were featured in the November 2011 issue of the American Journal of Transplantation. The researchers previously found that the MELD score excessively weighs the presence of serum creatinine in deciding which patients receive liver transplants. Higher levels of serum creatinine are a sign of renal dysfunction. When MELD was implemented, more patients with pre-transplant kidney dysfunction began receiving liver transplants. The incidence of simultaneous liver and kidney transplant has also increased significantly in the MELD era. Researchers say that along with the increasing incidence of post-transplant kidney failure, chronic kidney disease could also be on the rise, affecting health care costs in the future. The findings also highlight several modifiable risk factors that could be addressed before, during or after liver transplant and help prevent post-transplant kidney failure. The researchers found that along with African American race, hepatitis C, pre-liver-transplant diabetes, higher creatinine, lower albumin, low bilirubin and high sodium were significant predictors of post-liver transplant kidney failure. “Modification of some of these risks that would improve renal function may help prevent or delay post-liver transplant kidney failure,” Sharma says. Funding: The research was supported by the American Society of Transplantation, the National Institutes of Health and the Scientific Registry of Transplant Recipients.